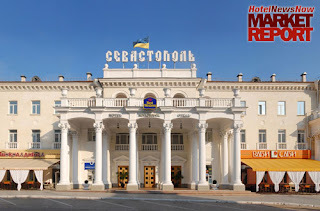 KIEV, Ukraine -- Hotel development in Ukraine was booted forward thanks to the Union of European Football Associations 2012 championship, but now the excess supply is threatening to tackle hotel operating performance. 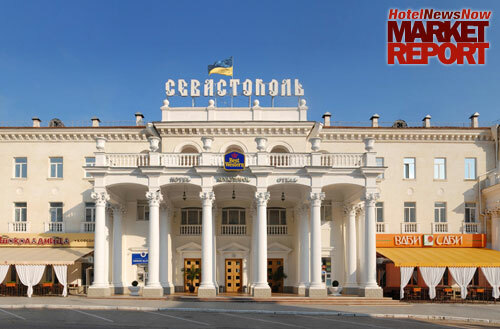 The Best Western Sevastopol Hotel in Ukraine is seeing an increase in leisure demand. Developers were eager to build leading up to the tournament, but now that the footballers and their fans have come and gone, occupancy has suffered, said David Jenkins, head of Jones Lang LaSalle’s Hotels & Hospitality Group, Russia and the Commonwealth of Independent States. “It was clear this … boom in hotel development could not be sustained after the championship’s demand, and we now have a situation in Kiev where supply outweighs demand,” he wrote in an email. He said in 2012, despite the UEFA event, occupancy in Kiev dropped to 44% from 54% a year earlier. Average daily rate increased by 3% to $266. “It is still an expensive market for hotels, and rates are expected to drop further, and we will begin to see clear segmentation between upscale and midscale hotels,” he said. The 160-room Cosmopolite Hotel Kiev is one of those new hotels that opened during the UEFA rush. David F. Page, GM of the 17-month-old hotel, said he believes the country’s hotel performance will be “flat at best” in 2013, taking out the extra football-related demand from 2012. Page said before the football championships, Kiev had approximately 2,000 4- to 5-star hotel rooms. “Occupancy is the challenge as the pie (demand) is the same but the slices are ever thinner,” he said in an email. Despite the dour outlook, sources generally were optimistic about the future of Ukraine’s hotel industry. The percentage of revenue coming from tourists visiting the Crimean peninsula is growing, which is important because that region accounts for more than 50% of annual hotel revenue, said Kristina Malkhazova, deputy GM of the Best Western Sevastopol Hotel. She said that percentage has been climbing steadily. There are other reasons to visit Ukraine besides tourism, she added. “In my opinion, Ukraine has everything to become a medical tourism center in Europe. The low cost of treatment along with the highly qualified specialists is a major attraction for medical tourists seeking treatment in Ukraine. Page is also optimistic about the long-term outlook. “Long-term outlook is (definitely) positive,” he said. He said the arrival of global brands was a much-needed occurrence for the country because it helped lift the overall quality of the country’s hotel stock. Previously, the old Soviet-style hotels catered only to the lower end of the market. Malkhazova echoed that sentiment. “Every smart hotelier understands that the well-known brand’s name for the hotel helps to increase revenue by attracting foreign guests who actually understand what benefits they will get in a chain hotel,” she said. Still, Ukraine’s hotel future might be dependent on political factors, Page and Malkhazova said. “The investment environment here is not positive currently as the world is waiting to see which way Ukraine decides to look (Russia or the European Union),” he said. Malkhazova said the Ukrainian Tax System and a new smoking ban have both had a negative effect on revenue. “Fortunately, different tourism and hotel associations are trying to maintain an open dialogue with the State concerning different business aspects,” she said.